Ai Weiwei – a Chinese contemporary artist and activist born in 1957 in Beijing. As an artistic consultant, together with Swiss architects, he worked on the building of Beijing National Stadium which was built for the Olympic Games that took place in 2008. Since Ai is also a political activist, he spared no criticism of the Chinese government’s approach towards the democracy and human rights. Moreover, he revealed secret plans of various corrupt organizations. In 2011 Ai was arrested in Beijing Capital International Airport and held there for 81 day without any official accusation, however, it was reported that he was taken into custody due to certain economic crimes. 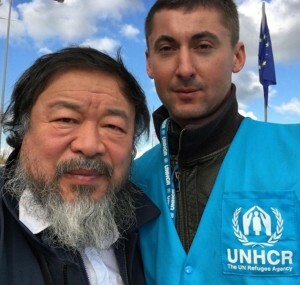 Ai Weiwei, who is unafraid to speak thetruth, currently speaks up about the issues that are relevant not only to Chinese people, he shares his ideas about the refugee crisis – the most discussed global phenomena at the moment. What is worth mentioning is that Ai is not trying to fight against the migrants, on a contrary, his aim is to raise awareness of the plight of refugees, to look at it from a different angle and to make people think more of the reasons why those refugees are compelled to leave their countries and seek asylum somewhere else. On the Greek island of Lesbos Ai Weiwei opens the studio where he will express the situation of migrants and refugees through his works of art. The island of Lesbos is the third largest Greek island and, according to the artist, this is the main area for refugees from Syria, Iraq and other war-torn countries to get to Europe. This is the place giving them hope to have a safe and happy life. “A lot of people have lost their lives under the waves… we need a memorial,” says Ai. In order to create artworks that would be linked to the crisis, the artist wants to get more involved into the situation, in addition to this, he wishes to create and spread the consciousness about this issue. Furthermore, the activist expresses respect to Germany, where his son lives, which managed to welcome a great number of refugees and helped them integrate in the society. Even though Ai Weiwei himself is not able to be on the island all the time, he hopes to come here as often as possible, while at least six students of the artist will constantly work in his studio. The situation regarding refugees is getting worse and worse. During the year of 2015, more than 1 million migrants and refugees illegally came to Europe, this number is 4 times bigger in comparison to the data of 2014, as claimed by International Organization of Migration. Nevertheless, Ai is trying his best to improve the situation, he helps and supports the refugees instead of fighting against them.